WALNUT CREEK, Calif. - The Clubhouse, with Greenery Restaurant, for Diablo Hills is located just across the street from Heather Farms, a large recreational complex in Walnut Creek. This nine hole Bent grass course was designed by Robert Muir Graves and built in 1968. The course is 4,604 yards from the blues with a rating of 61.8, a slope of 105 and a par 33. Unlike executive courses, Diablo Hills is a little more than half of a tough 18 hole course. Under normal circumstances it even has a par 5 hole on the 8th. There's a putting green next to the first hole. Green fees are $12. Carts are available to rent. The 1st hole, which begins at the Clubhouse, is a 264 yard par 4. A fence lined with houses behind it comes into play on the right narrowing down the fairway to the green. After a midway dip, it's uphill to the green. The pin is at the back of the green which tips away from the tee. 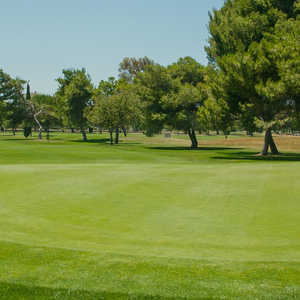 The green, which has three sandtraps, is surrounded by pine and maple trees. The 3rd hole, a 106 par 3 is tricky. The green, one easy stroke away, is hunkered down in some bunkers with sandtraps. Hit the ball to the right. Avoid the area past the green. 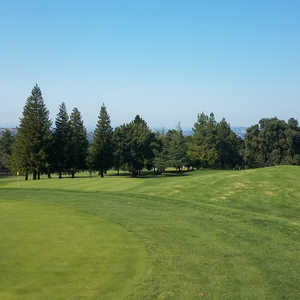 The 4th hole, a short 80 yard par 3, lays right next to Ygnacio Valley Road. This is a steep downhill, with trees coming into to play on the right which narrow the green considerably. Hit the ball past the pin more than 10 yards and you're in the street. The 5th is a blind hole around to the right. A 323 yard par 4, tee off up the fairway to the left. An octopus sandtrap which you can't see from the tee comes into play on the right narrowing the fairway down to about 20 yards. What you can see on the left is a tall pine tree near the fairway which splits into two about halfway up...that's what you should aim for. I hit my five iron about 170 yards right up to the lip of the sand just before my playing partner apologized for not mentioning the hidden sand trap. Once you get to it, this green is relatively flat. The 6th hole, a 254 yard, par 4 is straightaway with many sandtraps protecting the green. There's a right to left slope which comes into play on the fairway. The green narrows down to the back. This is a beautiful hole, surrounded by many pine trees. Normally the 8th hole is a par 5, almost 500 yards uphill, but right now it's been cut back to a 260 yard, par 4 while they do some work around the tee. It's uphill to the green. You'll see a dinosaur back rock formation marching along on the left next to the fairway, stay to the right of that . Diablo Hills, located in the center of a prosperous community, is extremely popular. The 9th hole is a 310 yard, par 4 with the wildest field of sandtraps I've ever seen. To get to the green, you have to hit the ball about 75 yards over the sandtraps . And although you can see the top of the flag, what you don't know is the shape of the green. The green is narrow from front to back and long from right to left. The large tree at the back of it is to the left of center. Diablo Hills, located as it is in the center of a prosperous community, is extremely popular. Tee times are running about every eight minutes on a Tuesday in December. 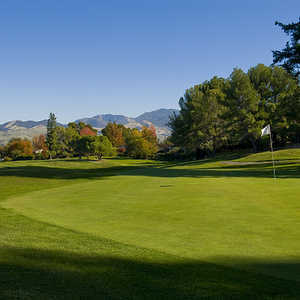 Diablo Hills offers great senior specials which include lunch, a cart, and a round of golf. The golf pro is Nick Andrakin. Call (925) 939-7372 for a reservation.